Mark, Tinker, Speedy and Debbie. The success of Scooby-Doo, Where Are You! prompted Hanna-Barbera to take advantage of the new comedy/mystery genre they’ve blown the door off of. As a result, Hanna-Barbera produced numerous clones of Scooby-Doo, tinkering with the format ever-so-slightly so as to make it a feasibly different show. Scooby and the gang meet their progeny on The New Scooby-Doo Movies. Speed Buggy centered on an anthropomorphic dune buggy named Speed Buggy (Mel Blanc), or Speedy to his friends. Built by his driver Tinker (Phil Luther, Jr.), Speedy’s incredible speed made him a great race car. Speedy and Tinker traveled around the world to compete with their friends and pit-crew Mark (Michael Bell) and Debbie (Arlene Golonka). Between races, the group always managed to find themselves getting involved in some kind of mystery. Although Speedy had a mind of his own, Tinker devised a remote-control device for him used primarily for the kids to communicate with Speedy. However, it often ended up in the hands of their foes. Speed Buggy debuted on CBS on September 8, 1973. The series was written by Larz Bourne, Len Janson, Joel Kane, Jack Kaplan, Heywood Kling, Norman Maurer, Jack Mendelsohn, Chuck Menville, Ray Parker and Larry Rhine, and featured music by Hoyt Curtin. Several episodes were reworkings of stories from the earlier Josie and the Pussycats, another Scooby clone. Despite only being produced for a single season, the show proved popular; generating the usual wave of tie-in merchandise like lunch boxes, coloring books and board games. The show continued on in reruns for the next two years until ABC acquired the rights and began airing it in place of Uncle Croc’s Block in 1976. Later that year, the show moved to NBC where it replaced McDuff, the Talking Dog until 1977. Once reruns made their way to Cartoon Network and Boomerang, the typical Hanna-Barber laugh-track was removed. 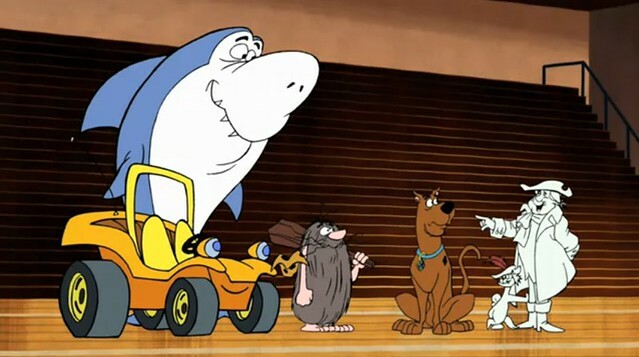 Speed Buggy, Jabberjaw, Captain Caveman, Scooby and Funky Phantom on Scooby-Doo! Mystery Incorporated. In 1975, Charlton Comics produced a 9-issue Speed Buggy comic book inspired by the show. 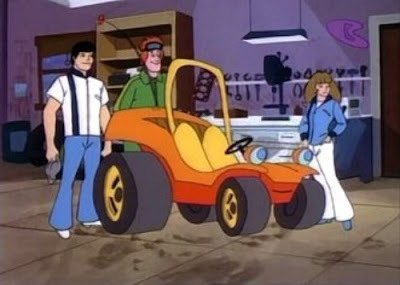 Shortly after the show’s debut, the characters guest-starred on an episode of The New Scooby-Doo Movies, and later Tinker (Frank Welker) and Speed Buggy appeared as regulars on Laff-A-Lympics as part of Scooby’s team, The Scooby Doobies. In later years, the characters would make guest and cameo appearances on programs such as Johnny Bravo, Harvey Birdman, Attorney at Law, and Scooby-Doo! Mystery Incorporated, as well as referenced to as costumes in the direct-to-video movie Scooby-Doo! and the Mask of the Blue Falcon. In 2018, an origin for Speed Buggy’s sentience was provided by Scott Lobdell and Brett Booth in The Flash/Speed Buggy Special #1, which was part of DC Comics’ second wave of Hanna-Barbera crossover one-shots. “Speed Buggy Went That-A-Way” (9/8/73) – The crew visits Debbie’s Aunt Belle and learn Belle’s cattle herd is being targeted by Beef Finger and his men. “Speed Buggy’s Daring Escape” (9/15/73) – Dr. Kluge sets out to capture Speed Buggy in order to learn his secrets. “Taggert’s Trophy” (9/22/73) – The criminal called The Chief hits all the cars in the race with a mind-control ray. “Speed Buggy Falls in Love” (9/29/73) – Baron Vulch creates a female automobile named Mata in a plot to get a bugging device he hid in Speed Buggy’s trunk. “Kingzilla” (10/6/73) – Forced to bail out into a valley inhabited by giant gorillas, the crew is used by Professor Grovac to capture Kingzilla, who has taken a liking to Speedy. “Professor Snow and Madame Ice” (10/13/73) – Prof. Snow and Madame Ice plan to trick Tinker into installing his remote control device on their Freezemobiles in order to freeze the world. “Out of Sight” (10/20/73) – The crew helps Professor Rigby against his evil colleague Professor Rishna, with whom he had discovered a formula for invisibility. “Gold Fever” (10/27/73) – The crew encounter Gold Fever, who uses satellites to steal the world’s gold. “Island of the Giant Plants” (11/3/73) – The crew falls overboard on a cruise and winds up on an island of mutant plants created by Dr. Meangreen. “Soundmaster” (11/10/73) – Dr. Ohm and Panku use a replica of Speedy in order to frame the crew for the theft of an advanced battery. “The Ringmaster” (11/17/73) – The crew encounters the ringmaster who plans to use an animal-controlling calliope in a plot to rule the world. “The Incredible Changing Man” (11/24/73) – A scientist hides a special tape in Speedy’s cassette player, making them a target for the size-altering Incredible Changing Man. “Secret Safari” (12/1/73) – Varzak and Emil steal a giant diamond to power a Laser-Blazer for the intent to rule the world. “Oil’s Well That Ends Well” (12/8/73) – The crew tries to find out what happened to all of Oklahoma’s oil supply. “The Hidden Valley of Amazonia” (12/15/73) – Encountering the female-led society of Amazonia, Mark and Tinker are made slaves while Debbie is made into one of them. “Captain Schemo and the Underwater City” (12/22/73) – While on vacation, the crew stumbles upon Captain Schemo’s plot to rule the oceans with submarines. Originally posted in 2014. Updated in 2018.